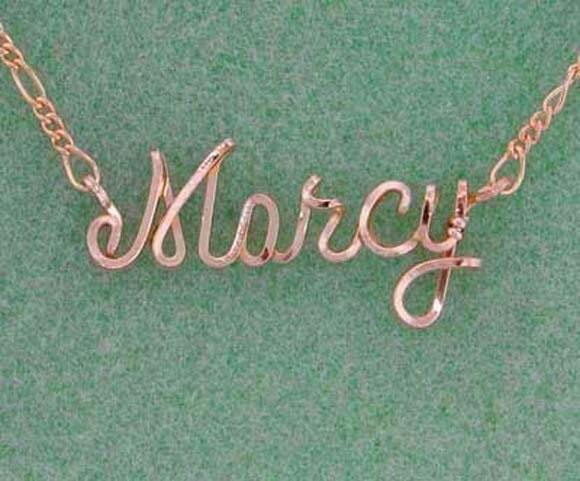 This unique one of a kind PERSONALIZED Necklace is available with ANY NAME you choose. Each necklace is made in your choice of Gold or Rose Gold Wire and comes with a 14k gold filled or rose gold filled Figaro chain 16" or 18". This is item is also available in Sterling Silver for a lower price. Check in my Etsy Store. Nothing says I love you like a custom made personalized gift!! Great for Valentine's Day, Birthdays, Sweetest Day, Anniversary, Christmas, Mother's Day, anytime!! ANY NAME UP TO 9 LETTERS! 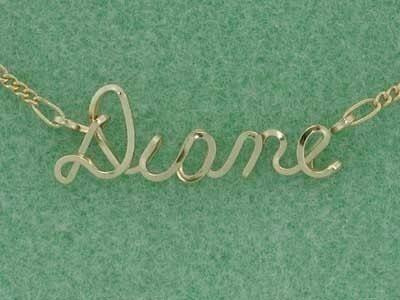 Please include your custom details: size, choice of gold or silver, and spelling needed in your order. Capital letters are approximately 3/8 inch and small letter are a bit over 1/8 inch. Size varies with the length of name.